We're in full shellfish mode for the summer! While we had some rock crabs a couple of weeks ago, we're now craving dungeness crab. One reliable source of excellent crabs is James Hook and Company. I gave them a call to see how they doing in their recovery from the fire that destroyed their landmark waterfront building. Al said they expect to have some retail operations in the old location within a couple of weeks. And, they have both dungeness and rock crabs at their temporary Northern Avenue space. It's a good idea to call before you head over to be sure they have what you want. We'll do that and reserve a crab feast for the weekend. The photo above is rock crabs steamed with lots of Old Bay Seasoning. We have our own system for bringing them to the table. In the kitchen, we pull off all the claws and pile them on a platter – big ones on one end, small ones on the other. Then at the sink we pull apart the bodies, clean them up a bit and pile those in the middle. This leaves much of the mess in the kitchen. This presentation is also less intimidating if you are introducing someone to crab pickin'. We still crack and pick and toss the shells around while we feast, but we make fewer trips to the sink to wash our hands. One of our favorite Annapolis crab houses has sinks all around the dining room for eaters who want a fresh start with clean hands part way through a bucket of crabs. Chilled bottles of white wine, a table full of friends and a pile of crabs is one of the best ways I can think of to spend a summer afternoon. Over the past few summers we've been taste testing lobster rolls around New England. Our quest began with those tempting Chowhounds over on the Boston and New England boards of Chowhound.com. They kept talking about lobster rolls. They introduced us to Neptune Oyster and the grand winner of all lobster rolls. However, many hounds call "lobster salad rolls," LOBSTER rolls. Growing up in Rhode Island and summering near the Connecticut border, I learned to love lobster rolls that are simply lobster on a toasted hot dog roll with the option of mayo or butter, ON THE SIDE! While others cover the lobster salad roll scene, BostonZest will begin the "Lobster Roll Chronicles"- our adventures in finding REAL lobster rolls in our native habitat. Today we'll take you to Jake's in Hull. This is a family-run place that grew up in a seaside location. It's both a fish market and restaurant. Across the street is the Nantasket carousel and beyond that the beach. Almost every table has a water view. The taste was fresh and clean. There was a reasonable amount of lobster and the sides were okay. This is a good value and when it isn't, Jake's won't sell it. When lobster prices when off the charts last summer, they took lobster off the menu until the prices became more reasonable. We still found lots to enjoy. By the way, if you ever see "clear clam chowder" on their menu, order it. They make one of the best clear Rhode Island style chowders we've ever tasted. We both adored it and hope it pops up again as a special. Here's a link to our post on that dish. Ed is not as big a fan of lobster (unless we are in Maine) so he had a big salad with seared scallops prepared very rare - just as he requested. While we only feature three in the photo, there were five scallops. We also recommend the steamers (steamed soft shell clams) at Jakes. We began our meal with a big bowl of beautiful Maine steamers with broth and butter. They even provided warm towels for hand cleaning after the steamer course. We have always had warm, friendly service at Jakes and this is one of those places where you can take your Mother, father great aunt, grandma, or a bunch of kiddies. Everyone will find something they like. Bonus! There are Skiball machines in the arcade on the Nantasket beach front. On a weekend in summer parking is scarce, but we adore spending time around here in the spring and fall. Jake's has it's own parking and they will let you have an extra 30 minutes to visit the carousel. Area farmers' markets begin the year with plants and greens and then each week the harvest grows until you walk up to the tables some week and see an abundance of fruit and berries and corn and tomatoes. 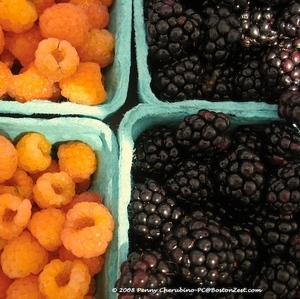 This week there were berries- raspberries, blackberries, currents, gooseberries and blueberries. Stone fruit like apricots and peaches plus early apples and cherries were on hand. Even if you don't cook, you can eat healthier in summer by snacking on the good things the farmers bring to the city. Here is where you can find the location of a farmers' market near you. And, if you want to learn more about choosing and preparing produce, I highly recommend these two books. A reader emailed and asked us to identify the cheeses we showed in our report on lunch at L'Espalier. Since I still have the cheese menu that they provided, that's an easy request to fill. Here's the presentation tray. For new readers, we allowed the server to bring us what he felt was best at the moment. Rocchetta, Piedmont, Italy. Sheep, cow and goat's milk. Soft. Very rich and creamy. Lake's Edge, Blue Ledge Farm, Salisbury VT. Greg and Hannah keep 60 goats on their Lake Champlain farm, Lake's Edge is ash rubbed and soft/dense in texture with a satisfingly earthy and tangy flavor. The pure white paste is bisected with a thin layer of vegetable ash. Gouda, Holland, aged five years. Crunchy, with a sweet caramel flavor. Eat it like candy. Winnimere, Jasper Hill Farm, Greensboro VT. Andy and Mateo Kehler make this intriguing cheese each winter and spring. Modeled on a Swiss Forsterkasse –"lumberjack's cheese"– it is muscular and assertive. This raw milk cheese is wrapped in spruce bark, which imparts a woodsy aftertaste, and is washed weekly with the Kehler borther's own lambic beer. Bayley Hazen, Jasper Hill Farm, VT. A stunning full flavored blue from the Kehler brothers, two of America's finest cheesemakers. We were already fans of the Kehler brothers and Jasper Hill Farm. Tasting two of their cheeses in perfect condition really put them a the top of our cheese list. 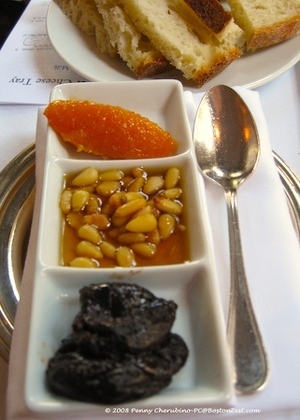 We were also served an arrangement of accompaniments- bread, pinenuts in honey, and fruit. However, while we did taste these offerings, these were cheeses that did not need distractions. We savored them on their own for the most part. 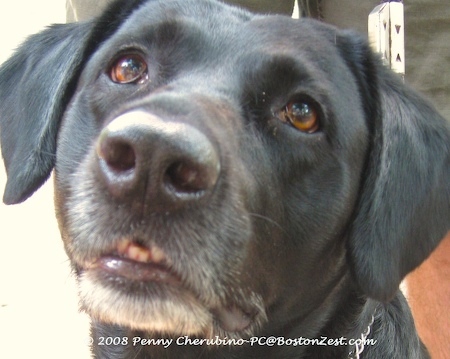 Miss Zoe lives with her family in the Back Bay and loves long walks on the Commonwealth Avenue Mall. She also loves treats and knows how to melt the hearts of those around her! She speaks volumes with those beautiful brown eyes. A sign that says that Neal's Yard Dairy exports a cheese, is reason enough for us to try it. Our taste in cheese seems to be very much akin to the people at Neal's Yard who select the cheeses they collect under their label and send from the United Kingdom to markets around the world. 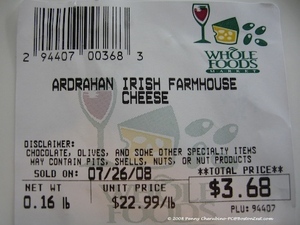 Today, at Whole Foods on River Street in Cambridge we chose their Ardrahan Irish Farmhouse Cheese for our weekend cheese course. This cow's milk, washed-rind cheese is soft and buttery on the inside with a funky rind. It's a cheese for the more experienced cheese sampler. And, please let the Ardrahan come to room temperature before serving. It would be a total waste to eat it cold. The official description from the dairy site is, "Meaty, smoky, creamy, succulent milky-sweet cheeses. 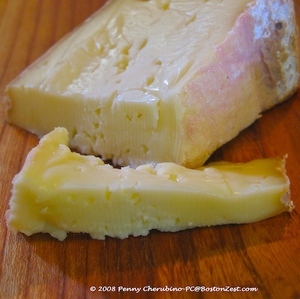 The interior has a freshness and moistness while the rind, which has been washed with saltwater, is savoury, and pungent." At Murray's cheese in NYC they say, "An ideal picnic cheese, with a hunk of fatty, cured meat. A thick, chocolately (sic) stout tempers Ardrahan's masculinity. Guinness is our go-to choice." Click over to Murray's full review under "Other Opinions" below. Here's the label from today's purchase with all the details. As you can see from the weight and price, we buy small pieces of special cheeses and eat them while they're at their best. Can you chop a tomato? If you can shop at a farmers' market, chop a tomato, mince some parsley, slice some scallions, and drizzle some olive oil, you can serve this appetizer. At the Copley Farmers' Market today, I bought garlic croutons at the Hardwich Center Cooking School and Bakery stand. Before Ed arrived home I chopped an Atlas Farms tomato that had been sitting on our kitchen counter since Tuesday's market. From the crisper, I grabbed a scallion (Atlas) and some parley (Siena Farms) and chopped them into mince (parsley) and rings (scallions.) These were tossed with the chopped tomato. I drizzled some extra virgin olive oil on the mixture, added some salt and pepper and let it sit and mellow for a bit before arranging the slices of garlic toast and the tomato mixture on a serving platter. By the time my hungry husband arrived home, it was ready to spoon onto the garlic bread slices and serve. Crispy bread, heirloom tomatoes-- simple, full-flavored, perfect - delicious!